Indulge in activities closest to nature - swimming, surfing, snorkeling, diving, sailing, paddling, fishing, and hiking for the active and stargazing, sunset cruising, and bird - watching for the idle. 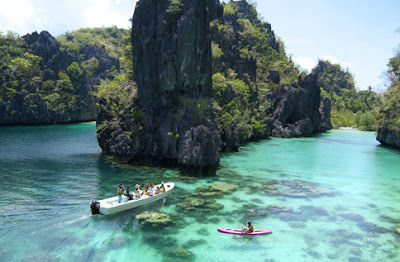 Indulge yourself to the beauty that the Palawan Island has to offer. Visit the legendary Palawan Underground River, recently nominated to be one of the New 7 Wonders of Nature, the longest underground river in the world with its wide hallways, cathedral-like chambers and great pillars of centuries old limestone formations. Discover the 1700 islets of Palawan, journey through these remote islets and experience unforgettable terrestrial and aquatic adventures. Walk through Palawan’s lush green forests, one of the world’s biggest sanctuary of old and replanted trees. Dive in the Tubbataha Reefs National Marine Park, the home of enumerable species of reef fishes, sea turtles, manta rays and dugongs. Explore Honda Bay, where it is equally well-known for its good reefs and coral boulders. Or visit by boat the beautiful island named ‘Dos Palmas’ with its white sandy beaches. Take a jungle trip to the wilderness and explore the waterfalls just nearby. All these eternal beauty and wonders of nature is just a couple of miles from 67th Heaven Holiday Resort. Copyright © 67th Heaven Holiday Resort Palawan.